Dried Apricot Soup with Emmer | Naturally.Dried Apricot Soup with Emmer | Naturally. A hearty wheat berry soup with a base of dried thyme, mint, and tart apricots. 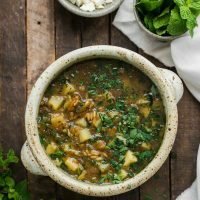 The soup comes from southern Georgia and is found in the cookbook, Taste of Persia: A Cook’s Travels through Armenia, Azerbaijan, Georgia, Iran, and Kurdistan. Heat a large cast iron or regular pot over medium heat. Add the olive oil followed by the onions. Cook for 5 to 6 minutes or until the onions are fragrant and translucent. Add the emmer, stir to coat, and cook for a minute. Add in water and broth. Bring to a boil, reduce to a simmer. Add the apricots to the pot, cover, and let cook until the emmer and apricots start to soften, 30 minutes or so (see note). Stir in the potatoes along with the dried herbs, salt, and pepper. Continue to cook until the potatoes are tender, about 15 minutes. Taste and add more seasoning as desired. Serve the soup with fresh herbs and sprinkle of feta. Tips & Tricks: As noted above, the recipe is from Taste of Persia but is written exactly as I made it. I recommend checking out the cookbook for all the possible options for herbs and toppings. Also, I’ve made this with California apricots since they tend to be more on the tart side (and dried tart apricots can be hard to find). Get the Taste of Persia Cookbook.